Noon on a Sunday on Koh Samui and that means it's time for the Koh Samui, Thailand weekly weather update; 24th September – 30th September 2018. This morning were the Samui marathon, 30km trail-, 10km- and 5km races as part of the Samui Festival activities. It seems that my injury has healed. After last weeks 5km race, I participated today in a 10km race. And all went well, my leg held out which is the most important thing. OI finished 4th in my age category 50-59 in a decent pace. Not my fastest but for the time being good enough. Next race coming up is the Samui Skal 10 mile run come 21st October. Now on to today's weather. It's sunny skies galore. The current temperature around noon is 38C! Hardly any wind in other words, it's hot! 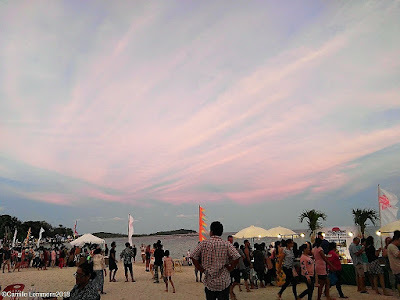 Koh Samui, Thailand weekly weather update; 24th September – 30th September 2018; A view on the sunset over the Samui Festival free buffet on Chaweng beach yesterday. It was a fun event. However long queues in front of the food stalls. As one of my Facebook friends said; "Samui Festival back bigger and....300 tables, 2400 chairs, 0 bins and 1 toilet...."
The forecast for next week looks good. There should be plenty of blue and sunny skies laced with an occasional shower or thunderstorm. Fairly typical for a nice October month. Enjoy your stay on the island and do sign up for one of the trips I offer around the island! Just one more day to go this month and time to say Goodbye to September 2018. This can be done under a blue sky with the sun being out and about this morning. Current temperature is 32C at 9.30am but it feels already a lot warmer and the temperature will most likely rise. The Samui festival is raging all over the island since a few days. Tomorrow will be the last day with a marathon, 30km trail run, a 10km and 5km race in Nathon. Plenty of stars and (future) superstars are performing at various locations around the island. This morning a 50km bicycle race is under way on the ring road and the ring road is or has been momentarily completely closed for all traffic. Safe passage for the riders is required! Goodbye to September 2018; Beautiful graffiti or a piece of art in Nathon. You decide. 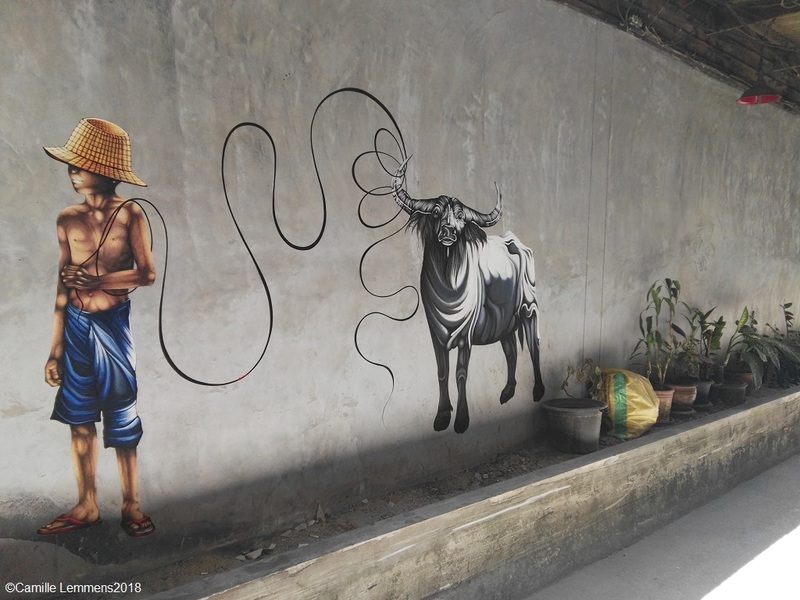 I loved it and was very positively surprised to find this on the wall in a very narrow street. The weather this September month has been good. Better then during August! Yes, there was some rain at times. However, nothing out of the ordinary or unusual September expectations. On the other hand though, there was plenty of sunshine as well. There were a couple of days with overcast, which I liked a lot, since they're not that steaming hot. Last week also saw the Give to Run-Mad hatter charity race. I unexpectedly placed second in the 5km race in the 40+ age category. After not having run for seven weeks due to injury, with just little preparation for that race, it felt good to be back in the saddle again. Now on to October. The first week of October has nice and sunny weather predicted. Make sure you don't get too sunburned and enjoy your stay on our island! Please do 'like' my Koh Samui blog Facebook page and enjoy the beaches around the island or in front of your hotel or resort and get some well deserved rest and a break. If you're done resting or need something else to do, there's plenty of things on offer on and around Koh Samui, you can go snorkeling or diving or take a dive course. It's Sunday morning again and time for the Koh Samui, Thailand weekly weather update; 17th September – 23rd September 2018. The running is done for the day. Today I participated in a 5km charity run at 'Run to Give'. Also known as 'the Mad hatter' run. After a 9 week break due to injury I placed second in my age category of 40+. Well above expectations and more importantly, my leg held out. Today's weather has been interesting so far! It started out with a few showers this morning around 5am. Around 8am you could spot blue skies over Chaweng and the Southern part of the island. By now, 10am, we also have sunny skies in Plai Laem. Current temperature is 30C and rising. Afther the rain it's going to be very humid! 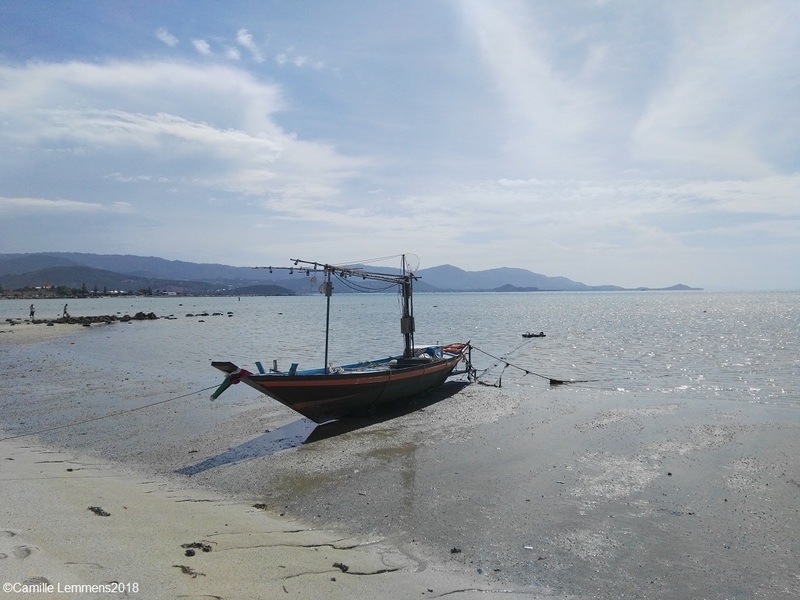 Koh Samui, Thailand weekly weather update; 17th September – 23rd September 2018; Plai Laem beach. Lovely location to have a walk with the dog. Our dog Jimmy loves it here! Near empty beach but very shallow, not very suitable for swimming. Last week was interesting. First of all, the expected storm wasn't too bad. The outskirts of typhoon Mangkhut, that wreaked havoc in the North Philippines and Hong Kong, was mild for Koh Samui. We had strong winds last Monday and Tuesday. After that the weather cleared up and we had tow very warm days. The end of the week saw cloudy to partially cloudy skies and a very nice and agreeable temperature. The temperatures ranged between 27C and 33C last week and we also had a few showers. Nice and refreshing! Next week is looking good. Plenty of sunshine and hardly any rain at all. It's looking good and I hope you will enjoy your stay on koh Samui, if you are visiting or staying here on Koh Samui! See you next week at the Samui Festival events! Please do 'like' my Koh Samui blog Facebook page and enjoy the beaches around the island or in front of your hotel or resort and get some well deserved rest and a break. If you're done resting or need something else to do, there's plenty of things on offer on and around Koh Samui, you can go snorkeling or diving or take a dive course. Please contact me if you're interested. You may also opt for a very special dinner experience at The Thai Experience. Behind closed doors, reservation only and a very enjoyable and well worthwhile way of spending an evening on Samui. Authentic Thai food and a great atmosphere. Can highly recommend this experience. Contact me for more detailed information on any of the options mentioned. 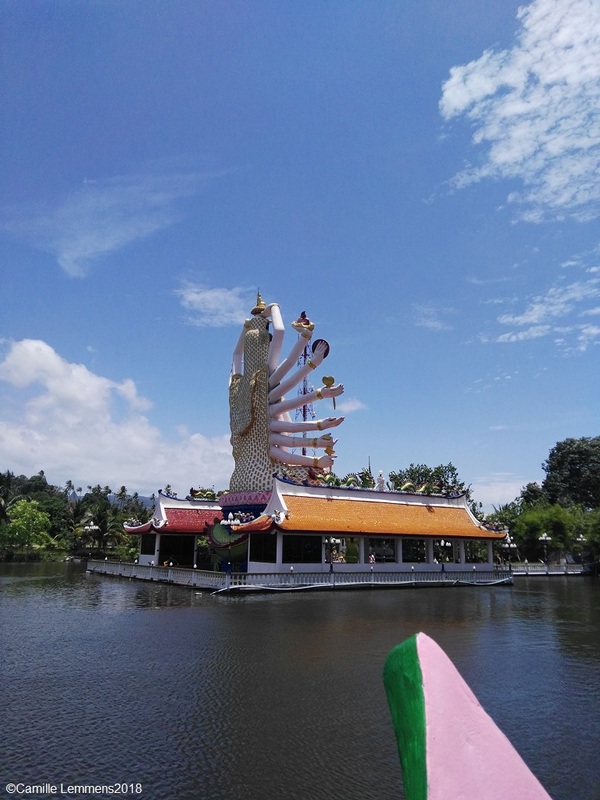 It's the Sunday morning groove and time for the Koh Samui, Thailand weekly weather update; 10th September – 16th September 2018. It's just past 10am and it's cloudy and slightly windy. A nice cool wind. Current temperature is 27C. Very nice and agreeable. Expect the wind to pick up during the afternoon. We're on the outskirts of Super typhoon Mangkhut. This super typhoon is punishing the Philippines and Hong Kong as we speak. Tonight and tomorrow should see more strong wind but slowly this should peter out until mid next week. I'm back into running mode again and am slowly building up my endurance and pace. It will be a few more weeks before I'm anywhere near the shape I was in 8-9 weeks ago. Next Sunday is the Mad Hatter run though and I will participate in the 5Km race, followed by Samui Festival's 10km race come Sunday 30th September. Last week saw some lovely weather around the island. Plenty of sunshine and only this weekend with lots of overcast. Hardly any rain and each shower is refreshing at the moment. Maximum temperatures ranged from 33C with a one off peak to 34C and 23C earlier last night. Wat Khiri Wongkaram in Baan Taling Ngam. It has undergone some serious reconstruction and looks marvelous. 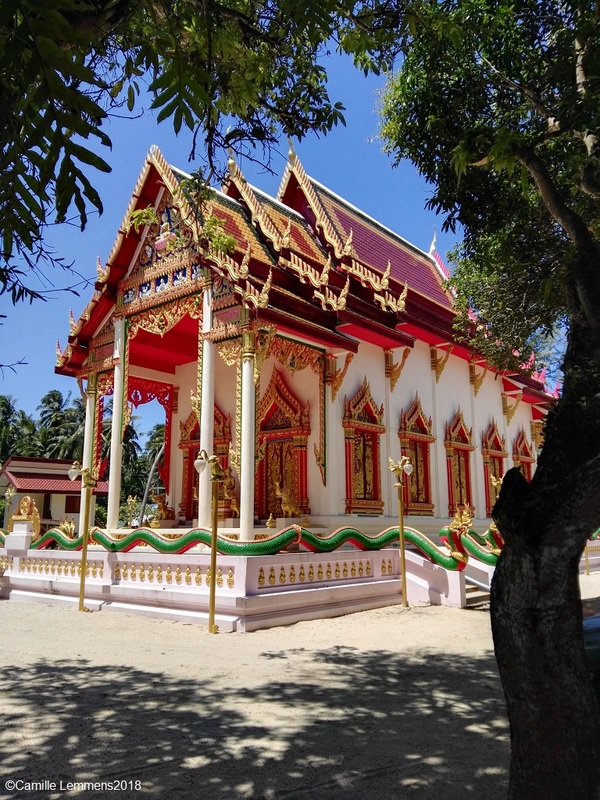 This Temple hosts the much lesser known remains of the second mummified monk on Koh Samui. Well worth a visit to explore the temple but mostly the much more unspoiled Southern part of the island. The forecast for next week looks ok. Until Wednesday a few showers and strong wind today and tomorrow. Come Thursday no more rain and very sunny skies! Sunday morning, it's time for the Koh Samui, Thailand weekly weather update; 03rd September – 09th September 2018. No long slow distance run, am just coming back from injury right now, but I'm keeping myself fit with very regular indoor cycling and weight training. On top of that I also manage around 10 minutes of planking per day. On to the weather though, it's nice and sunny this morning under an almost completely blue sky. At 10am it's 29C but it feels already warmer and expect more heat later during the day. 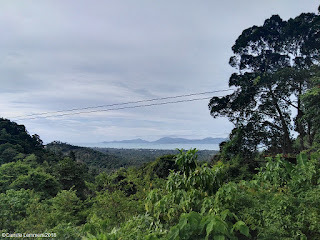 Koh Samui, Thailand weekly weather update; 03rd September – 09th September 2018; Spectacular view over Maenam beach and Koh Phangan. We're fairly high up in the mountains at the very end of Soi 5 in Maenam. There's a zip line place and a big tree with a platform around it. So you sit and relax on top and amidst the jungle canopy. Well worth a visit. Keep following Soi 5 in Maenam to the very end, park your car or motorbike, just follow the signs. After a short walk you will reach the tree platform. Have a drink and/or a small bite and enjoy the view and the zip line rides. Last week saw a good week. We had plenty of sun last week. Plenty of sticky and hot afternoons and just a few rain drops. Two days we had overcast, the rest was partially cloudy to blue! Nice! Maximum temperatures ranged from 25C to 34C. The forecast for next looks good, not too much rain, just a few showers. The wind is about to pick up, that should be nice and cooling. Expect plenty of sunshine as well! Go out and about and enjoy your time on Samui! Sunday afternoon and here we are with the Koh Samui, Thailand weekly weather update; 27th August – 02nd September 2018. It's sunny and hot today! Current temperature at 3pm is 31C but it feels a lot warmer. Last week was a good week with plenty of sunshine. There were also some nice rain showers that cooled things down a bit. But just a few! Maximum temperatures ranged from 21C at night to a blazing 36C during the daytime. 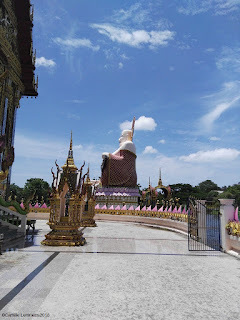 Koh Samui, Thailand weekly weather update; 27th August – 02nd September 2018; The Meh Guang Ihm statue at Wat Plai Laem from a different angle. The forecast for next week is looking good. A few isolated showers, a nice cool breeze and hopefully some partially cloudy skies or blue skies. Let's wait and see. f you like to donate to this blog, use this secure link PayPal.Me/CamilleLemmens. The first day of a new month and here we are; Welcome to September 2018. In general September is a nice month. It should have plenty of sunny days but during the mornings it starts to cool down. The afternoon can be 'sticky' hot, due to the high humidity. Last year we had a great September month, with plenty of sunshine and not too much rain. The two years before that we had a early September with rain and a late September with lots of rain. Let's cross our fingers and hope for a good one. Next week looks a bit like mixed bag, with some sunny days but also with some showers being predicted towards next weekend. There are also two very interesting running events this month. Sunday 23rd September will see the Mad hatter run at 'the Wharf' in Bophud. There will be a 2km, 5km and 10km race. Come Sunday 30th September the big Samui Festival is due. A 5km, a 10km and a full marathon race are scheduled. That same day there's a 30km trail run scheduled. Exciting and hopefully this will continue over the next couple of years. I was training for the full marathon but injured myself 6 weeks ago and couldn't run since. I hope to be able to run the 5km at the Mad hatter and the 10k at Samui festival. Hope you enjoy your stay on Samui during this month and let me know if you're interested in one of the events that I offer.